Love quilting with a longarm machine? Are pantographs your jam, but you’re ready to branch out a little? Sometimes the hardest part is just knowing where to start! Learn the basics of free motion quilting on a longarm machine during my Breaking into Free Motion class! Register for Breaking into Free Motion Quilting! Wild Swirls is a great skill builder stencil. It is a combination of swirls and swoops that is perfect to try once you feel like you have the basic swirl down and want to try something fancier. Its organic shape can look like fire on a hot orange, yellow or red quilt, or like leaves on a floral quilt. And its beautiful design is pretty enough to stand out on its own in negative space on your quilt, or to create fabulous texture as an all over design on a busy quilt. Are you ready for a new longarm quilting video tutorial? You may remember the last video showing how to quilt the Daffodils design (if you need a refresher, click here to watch the video again). My newest design, called Twin Tulips, is a variation of those simple elements. Check out the video below. If you’re looking for a sweet floral design for your next baby quilt, you’ll love the Daffodils quilting design! In my latest video tutorial for APQS I’ll walk you through the steps to quilt this adorable little design. 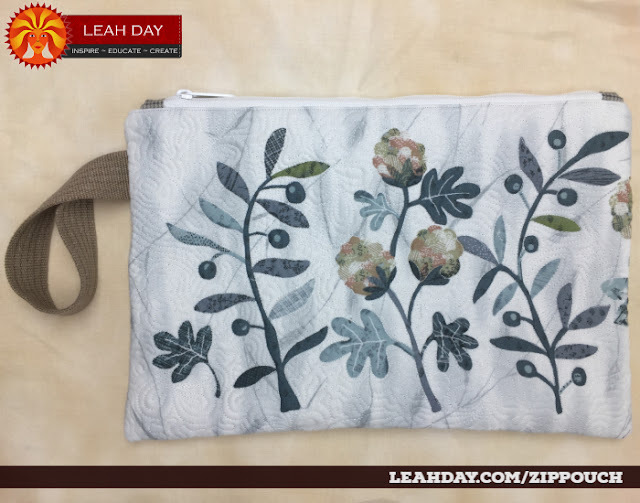 Click Here to find the zippered pouch tutorial too! In my last video tutorial I showed you how to quilt the Daisy Brambles design. In this video tutorial we’re going to start with that same daisy motif and add a sweet heart to it. This design is so romantic and delicate, I think it would look perfect on a wedding quilt or a baby quilt. Depending on how large your daisies and hearts are, it will also quilt really quickly too! Take a look at the Daisy Love video below and give it a try! The post Video Tutorial: Daisy Love appeared first on . In my last video tutorial for APQS I showed you how to quilt beadboard or piano keys in your borders. Now that you’ve had time to practice adding those to your quilts it’s time to dress them up a bit! In this video tutorial I show you three different ways to decorate your beadboard border designs. Watch the video below and let me know which one is your favorite in the comments! The post Video Tutorial: Decorative Beadboard appeared first on .